Congratulations go out to Fodor’s Travel for being included in Apple’s “Best New Apps” category following the recent launch of the iOS9-optimized City Guides app. Fodor’s City Guides provides 22 unique travel guides for your iPhone and iPad. So whether you are visiting Boston or Barcelona you can find information, book hotels, make restaurants reservations, or get a guided tour all from the comfort of the app. It doesn’t matter if it’s last minute or months ahead, this app has you covered. – Trusted recommendations searchable by destination, price range, or category of interest. Recently, Red Foundry was named a Top Chicago App Developer by research firm Clutch, based in Washington, DC. Clutch is known for offering both objective and extensive research coverage on mobile app development companies in various geographies. Red Foundry is excited to be positioned so highly among the other companies in the Chicagoland area. In fact, over twenty app development companies were included in the study with Red Foundry topping the list. 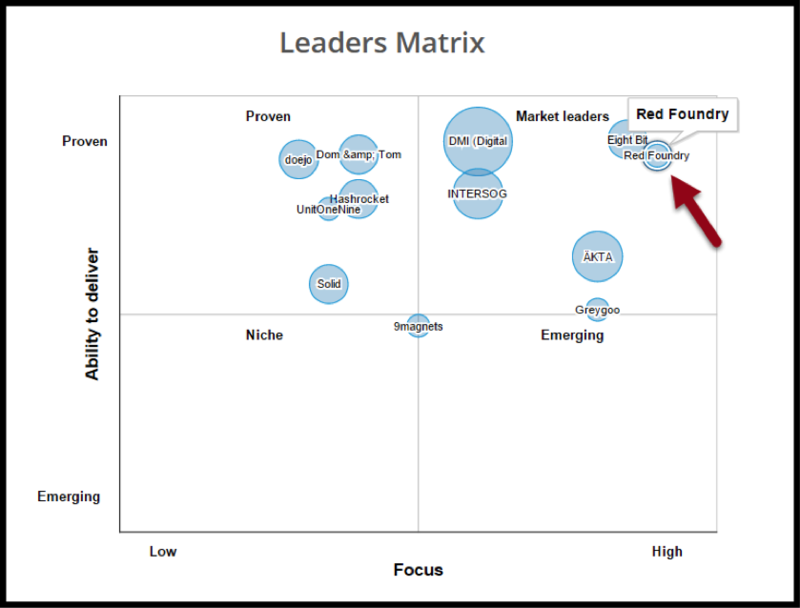 Clutch analyzed Red Foundry’s previous work, client base, and overall ability to deliver on development projects, to map us against the other Chicago-based firms on their Leaders Matrix. We’re always excited to be recognized externally for our work but really enjoy being able to take our years of experience in building amazing mobile apps and package it into solutions for clients like FanAngel while lowering the complexity and risk of building killer custom native mobile apps. 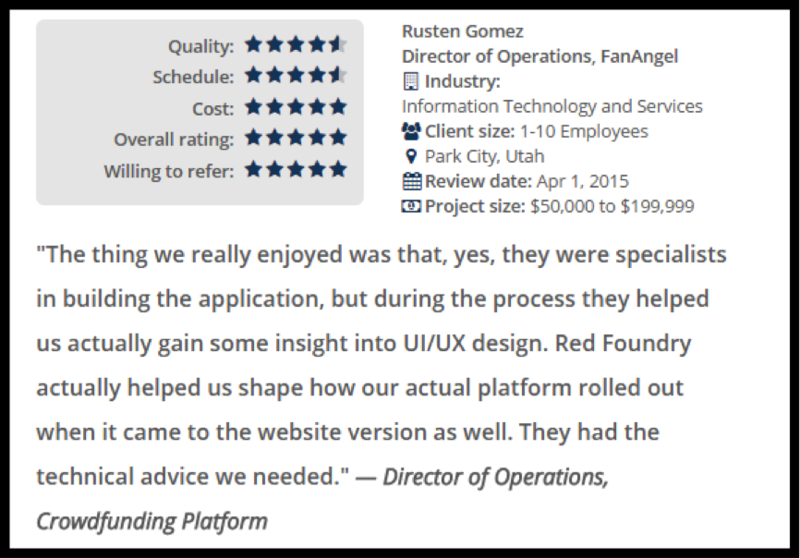 To learn more about how we were evaluated by Clutch check out the Clutch Methodology or browse through the overwhelmingly positive Red Foundry Reviews as provided by our clients. Apple Pay has been getting a lot of press recently and, generally speaking, there is a lot of confusion about what it means to consumers and, just as importantly, to app owners. Most articles and news segments describe Apple Pay as the latest way to pay at the check-out counter. Simply wave your phone in front of new Apple Pay readers and instantly – transaction complete. While this new feature of the phones is cool it is only part of a bigger story…. 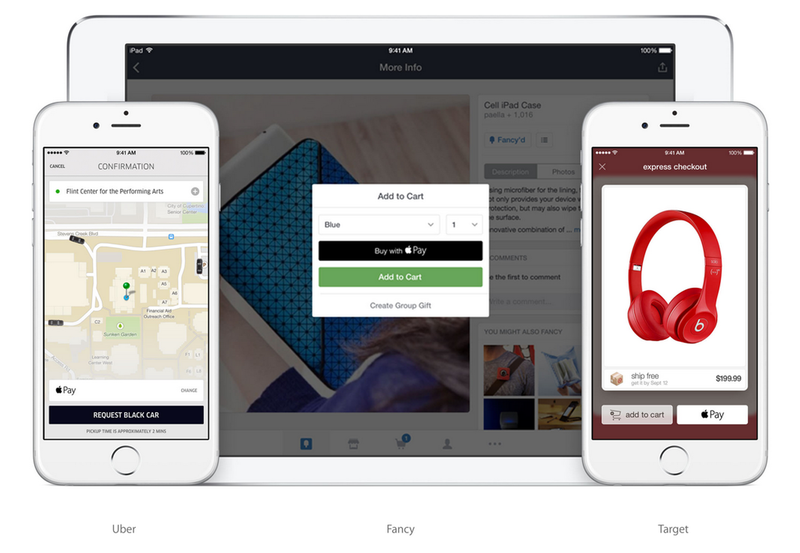 essentially, how Apple is positioning to revolutionize online commerce through mobile apps. Entering credit card information for purchases has always been and still is a huge barrier for consumers using mobile phones to shop. Buying airline tickets requires entering your name, address, card number, expiration date, cvv, and more – all on a tiny screen. If users needed to do that every time they wanted to buy a new level in candy crush, or coins in farmville – they wouldn’t do it and companies like Zynga wouldn’t be worth billions of dollars. Apple knew that and years ago invented in-app purchasing for digital goods. Enter one password (or now just swipe your thumb) and complete your purchase in an app in one simple, painless step. Similar to the way in-app purchases revolutionized the way we buy and sell digital goods on mobile phones, today Apple is about to change the way we buy and sell other types of goods using our phones. Study after study has proven the simpler it is to complete an order, the more money consumers will spend online and in mobile apps. Now, the promise is that out online check-outs will be simple and will happen with a single touch. No longer will you need to manually fill out lengthy forms or repeatedly type in shipping/billing information. Further, your actual card number will kept private and not shared with the online merchants. See a new pair of shoes in the Nordstrom app – swipe your thumb and complete your purchase. Want to buy those tickets for an upcoming concert in the StubHub app, add them to your cart and swipe your thumb. Want to subscribe to a magazine subscription, swipe your thumb. At Red Foundry we’re truly excited about the possibilities, and if you accept credit cards for anything in your business, adding Apple Pay and Touch ID to your app should be your number 1 priority to get ready for this major shift in commerce and take advantage of the increased sales due to ease of checkout. If this sounds more like revolution than evolution, you might ask yourself…. Is your app ready? Mills & Boon, the undisputed UK market leader in romance fiction publishing (think Harlequin romance novels), has decided to become disruptive by developing its own app that allows their fans to read eBooks on the go. Digital supermarkets run by companies like Apple, Amazon and Kobo currently dominate the eBook market, taking a big slice of the profits-pie each time a book is downloaded. In an effort to streamline the publisher-to-reader process, Mills & Boon has created their own app reader that users can easily download to their iOS or Android mobile device. The company is hoping that, since more people are reading eBooks on their smartphones and tablets, their big gamble will pay off. Red Foundry is proud to announce that the Fodor’s City Guides app is a winner in the 2013 Lowell Thomas Travel Journalism Competition, taking the gold in the ­­­­Travel App category. The annual competition, honoring outstanding print, online, and multimedia work, travel photography, and audio and video broadcasts, is sponsored by the Society of American Travel Writers Foundation. Winners of the awards, the most prestigious in the field of travel journalism, were announced across 25 categories Oct. 21 at the SATW convention in Biloxi, Mississippi. The 29th Lowell Thomas competition drew 1,257 entries, which were judged by members of the faculty at the University of North Carolina-Chapel Hill School of Journalism and Mass Communication. The Foundation distributes nearly $20,000 in prize money to individual winners. Generous donations by this year’s Underwriters, the Tourist Office for Flanders-Brussels and Travel Guard, help make the prizes possible. The Fodor’s City Guides app can be downloaded here… cheers!